SCCM 1902 Production Upgrade GuideMicrosoft released a couple of update rollups (hotfixes) for the latest production version of SCCM 1806. 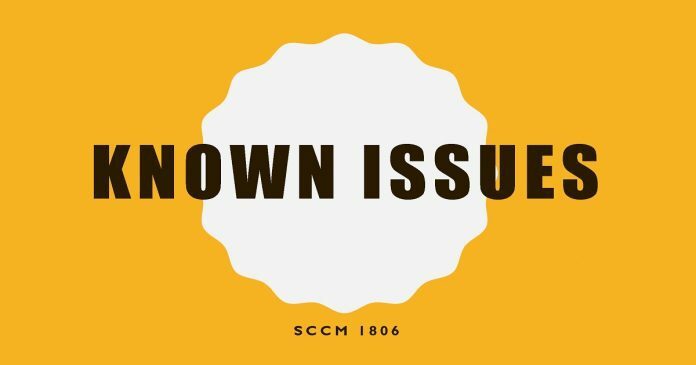 In this post, we will see the SCCM 1806 known issues and how to fix those known issues. The Video tutorial will help you to understand how to install SCCM 1806 hotfix. SCCM 1806 known issues are already fixed by Microsoft SCCM team. 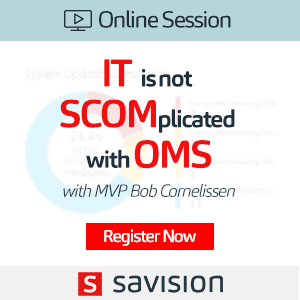 Are you looking for SCCM 1810 Known issues? Fix to SCCM 1806 Known Issues? 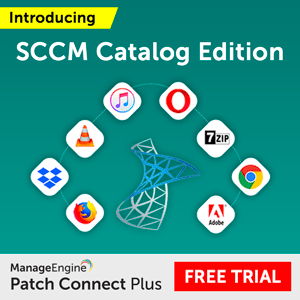 How to Confirm Hotfix is Required for SCCM Environment? Microsoft fixed many issues in the latest version SCCM 1810. Also, Microsoft updated the fixed list of issues in the KB 4482169. Microsoft already released two hotfixes to fix all the documented known issues for the 1806 version of SCCM. So all the issues highlighted in the post are already fixed with the latest hotfixes or the latest version of 1806. SCCM updates and servicing is intelligent enough to filter out unwanted updates hotfixes from your SCCM console. So most probably if your SCCM environment requires an update, it would be visible in your SCCM console. Microsoft Released RollUP update KB 4462978 for SCCM 1806. 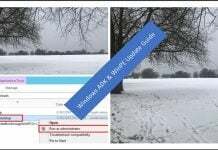 This update KB 4462978 replaces previously released update KB 4346645 or KB 4459354 depending on the different SCCM first wave version. Microsoft released another hotfix for SCCM 1806. You can confirm whether the SCCM 1806 hotfix is required for your environment by comparing the SCCM updates and servicing package guide. 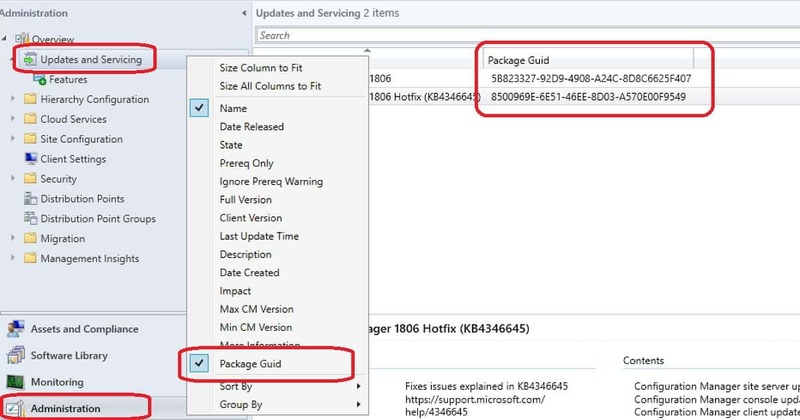 To verify which wave build is installed, look for a package GUID by adding the Package GUID column to the details pane of the Updates and Servicing node in the SCCM console. Following list provides SCCM 1806 Known issues. I will try to update it whenever Microsoft releases new hotfixes. After the WDS-less PXE responder service is configured after an upgrade to SCCM 1806, it may reject PXE-boot requests from clients when the management point (MP) is remote. Task sequences that have a restart action before an Install Packages action may fail. SCCM 1806 Known Issues fixed. CMPivot cannot run a PowerShell script that contains a command to retrieve a registry entry if the registry contains a NULL value. CMPivot is missing the “not like” operator. CMPivot fails to run a PowerShell script that contains a command to retrieve a registry entry if the registry value contains a NULL. Ccmexec crashes continuously when Pull DPs are installed. OfflineServicingMgr fails to find the content library location when the Content Library is on a Universal Naming Convention (UNC) path. OfflineServicingMgr leaks handle and cause a decrease in performance if it fails to find the content library location on a UNC path. When you edit an existing co-management policy, instead of the changes being saved, the policy is reset to the default state of No AutoEnroll, all workloads set to SCCM, and pilot collection is empty. CRP certificate revocation is processing slowly and is blocking the main thread in SMS_CERTIFICATE_MANAGER. On upgrade, if you have any deployments that require approvals that reference built-in CIs created before 1706, you will see significant SQL I/O and high CPU utilization on the MPs as the CIs and deployments are updated. Phased Deployment Status Wizard shows multiple rows for the same phase with inconsistent data when a collection has machines spread across multiple sites. Count of AADJoined and HybridAADJoined may be incorrect on the Co-Management dashboard. Excessive client request time-outs on the cloud management gateway. After an upgrade to 1806, the performance of the site may be decreased with high I/O and CPU use by sp_UpdResPolicyMap_PolicyAssignment. Super peers may fail to download partial content when the management point is remote. State message component SMS_STATE_SYSTEM reported as critical because of a backlog of Script state messages with no output data reported as corrupt. Download fails when you use CCM client Delta Download channel to download express updates full files. The process MP_GetSuperPeerContentLocations stored proc may cause decreased SQL performance and block threads. Pull DPs may fail to be upgraded because MOFCOMP silently fails when Distribution Manager run it. If the Pull DPs are not upgraded, content cannot be downloaded. The online client status chart on the CMG Dashboard does not aggregate hourly data correctly from multiple MPs. When you create an SRM based CMG or CDP by using an existing resource group, the region of the resource group is used to create the resources regardless of the region that you specified. DP upgrade fails If PXE without WDS enabled. CMPivot returns NULL if any registry entity values are NULL. BCP for BGB_NetworkInfo live data fails if there is a duplicate subnet for the same IP address and same client. CMG HTTP listener stops because of an HttpListenerException. After WDS-Less PXE is enabled, some clients may not start Task Sequence Wizard because a password is incorrectly expected when multiple clients start at the same time. SMSTS.log shows that the password is incorrect even though the wizard not displayed and no password is set. SCCM 1806 Known Issues fixed. On a passive site server, the state message files in the management point staging folder may not process. 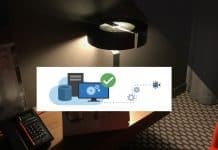 The WDS-less PXE responder service, configured after upgrade to SCCM 1806, may reject PXE-boot requests from clients when the management point (MP) is remote. AtomicUpdate and BundledUpdate metadata used for delta download can get truncated. This causes Unified Update Platform (UUP) updates not to be downloaded. When the SCCM generated certificate option is selected for the site, and a client fails to download content because it does not have the client public key infrastructure (PKI) certificate if the client is restarted it will still fail to download content even if token-based content locations are available. After the 1806 upgrade, SCCM clients fail to send client or Management Point (MP) communication status Fallback Status Point (FSP) messages. When content that downloads from delta download or CMBITSMgr, the optimal content location is not chosen for all content within a package. Some client state messages may not be sent, resulting in some reports such as co-management, Windows Upgrade for Business and deployment upgrade reporting being out of sync. SCCM 1806 Known Issues fixed. An Internet-only AAD-joined device cannot register if an MP was removed from cloud management gateway. Task sequences that have a restart action before an Install Packages action may fail. Unable to delete a secondary site. After the deletion action, the site remains in either an “active” or “deleting” state. After you update to SCCM, version 1806, software updates do not download. This failure occurs only in environments that use Windows Server Update Services (WSUS) on a disconnected (air gapped) network. For software updates that contain express installation files, SCCM synchronizes the Express.cab file and distributes it to the client. This behavior occurs even if the client does not require the Express.cab file for a given deployment. SCCM 1806 Known Issues fixed. After the SCCM client is installed, the following registry key may still contain data. This leftover data can interfere with future management by either SCCM or Microsoft Intune. May be this will help AutoPilot Rip and Reuse where the client shows as MDM/ConfigMgr Agent managed rather than MDM managed client. The Adjust the download speed to use the unused network bandwidth (Windows LEDBAT) distribution point property does not work as expected in SCCM 1806. SCCM 1806 Known Issues fixed. The promotion of a passive site server to active mode may fail. This issue can occur if the installation of the SDK provider on the passive server overwrites information in the SMS registry key. The SCCM console may stop unexpectedly when you try to open a new window, such as the Task Sequence Editor window. The MP_GetSuperPeerContentLocations peer cache stored procedure is optimized to improve SQL performance and accuracy of results. Multiple improvements are made to the Lifecycle Dashboard. After you change a task sequence that contains a hidden variable, that variable may be overwritten with incorrect information that results in the task sequence failing to run. Third-party software update catalogs or file contents that contain a space in the URL or file name do not synchronize or publish. 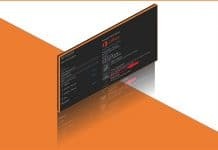 When changes are made to a controlled folders access, the Exploit Guard policy does not take effect on clients as expected. SCCM 1806 Known Issues fixed. After you update to SCCM 1806, the Browse button is disabled incorrectly for Product Codes in Windows Installer properties in the SCCM console. When the An administrator must approve a request for this application on the device option is enabled, Software Center displays an approved application for a given user on another device. For example, if a user requests and is approved for an application from computer Desktop1, that same request is are listed as approved when that user logs into computer Desktop2. SCCM 1806 Known Issues fixed. The SMS Executive service (smsexec.exe) may stop unexpectedly when it processes client health data. After you add an Azure Active Directory tenant to the SCCM console, the site database may grow unexpectedly. This issue occurs because of the addition of extraneous audit information to the site database. Suspending a phase deployment configured to begin sometime in the future may result in the client starting that deployment instead. The Windows Server Update Services (WSUS) SCCM component on a site server does not communicate with a remote WSUS Server when a proxy is configured for that site server. Certificate selection parameters are not recognized during new client installation if they are passed by using a configuration file. After disabling the Server Group option for a collection, member clients incorrectly look for a deployment lock. When this issue occurs, the client cannot install updates. 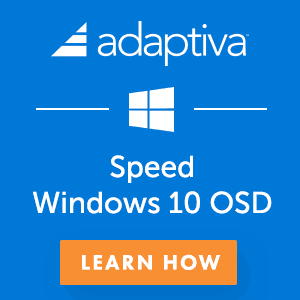 After you update to SCCM 1806, co-managed devices may not run deployments targeted to users. The Install software packages according to dynamic variable list option is automatically selected. This issue occurs after you change an existing task sequence in the task sequence editor to add Install Package actions. Can you please guide me how I can fix KB4465865 installation error? Error information persisted in the database. Can you please share at what stage you are getting this error? I never seen an article like that from Microsoft and that is why I’m trying to put these in here. Why the KB # 4462978 (10/25/2018) is lower than KB # 4465865 (10/02/2018) ? Any interaction between both KBs? Additional hotfixes included in this update rollup KB 4462978 is KB 4465865 Software updates aren’t download in a Configuration Manager environment if WSUS is disconnected. Are you facing the issue like the client is not getting software updates ? The SCCM 1806 client version is updated KB 4462978? If so, I have heard someother customer that they also faced similar issue after upgrade. I would try to reinstall SUP but raising a ticket with MS would be better option. In Task sequence properties, Run another program first and user notification are not working in 1806. Hello Bhaskar – I have not tested the above mentioned scenario hence I can’t comment. I will post here if I see something similar to this after the testing. I have an issue, like a known issue sl no 39. but my sccm version is 1702.While downloading windows 10 update binaries .cab files getting downloaded but along with a blank express file is getting downloaded.Also in console download status is NO. Can you please guide me to resolve this issue. The above error means 0x80070002 – The system cannot find the file specified. Files are available at source.Only thing is express files are not available which is disabled at wsus and sccm as well. This could be something to do with proxy or other connectivity issue in your environment. Can you check that? No connectivity issues.Other OS updates are getting downloaded from same source.but problem with windows 10 updates. Also in shared folder windows 10 updates binaries getting downloaded along with blank express files.Also download status is NO. Unhandled exception has occurred in your application. If you click Continue, the application will ignore this error and attempt to continue. If you click Quit the application will close immediately. It would be great if you can check the event logs (applications) to get more detailed about the error. I would try to do a restart and then process it again. I have done a restart as a test already and there is no difference. the error happens immediately after right clicking the update in the Updates and Servicing pane. I am trying to deploy System Centre Endpoint protection update signatures through SCCM. But the SCEP is not getting updated. Message: %Microsoft Antimalware has encountered an error trying to update signatures. 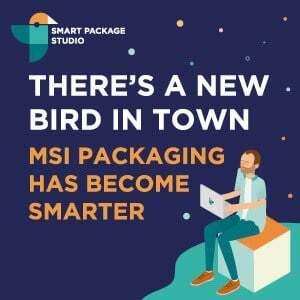 New Signature Version: Previous Signature Version: 1.281.194.0 Update Source: %File Share Update Stage: %Search Source Path: \\MM01-MCCS-01\Packages and Applications\SCEPUPDATES\x64\x64 Signature Type: %AntiSpyware Update Type: User: NT AUTHORITY\NETWORK SERVICE Current Engine Version: Previous Engine Version: 1.1.15400.5 Error code: 0x80070002 Error description: The system cannot find the file specified. This issue is only seen in the servers which doesnt have internet connectivity and i had given internet access to this servers then the SCEP is up to date but when i take off the internet connection above error comes up and idoesnt gets the update. is there any version issue? which can lead to this? Like i am trying to push different version updates. does anybody notice after the upgrade the custom settings in discovery are being reset to default and other client settings too ? is that normal and should happen ? Which discovery all the discoveries? AD user discovery or AAD user discovery. I never seen this issue. So Far I noticed this under user discover. under search option we had “Discover objects within Active Directory Groups” unchecked. after the upgrade i found this options is checked. for the client settings portion I found that “use the new software center” was set to NO after the upgrade it has been reset to yes. Ah ok.. Have you raised any Microsoft Support ticket? If it’s a bug they won’t charge you !